I am 16 and have suffered from this disease for about 9 years. It has been hard on me due to friends finding the constant whip marks that look disgusting but I have learned to live with it. I have an allergy to heat and so I also get what is called a heat rash which I have had since I was 5. So having dermographia I suppose should hinder my school work, my hanging with friends, and having any rough physical contact with anyone, and for the longest time I agreed with that statement. However, I have learned to embrace it. I love to see what designs my friends can come up with on my back and the games we can play on my skin. It is no longer a curse for me and I no longer have to worry that if a guy friend puts his hand around me or accidentaly scratches me a hidious mark will appear. I once had a teacher thinking the marks that appeared after scratching my arm were from physical abuse at home and the list of questions went on and on. Information to prevent, control, and cure your hives can be found at this page. More information on the heat rash and other skin rashes can be found at the diagnose my skin rash page. Those are beautiful designs. 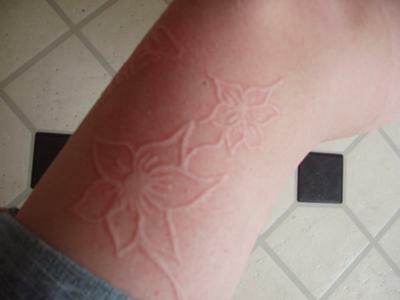 I have dermographia for the past three to four years. It began to appear after a dramatic time in my life. I take Publix Allergy Relief in the blue bottle everyday. I cannot handle my scalp itching, or the inside of my ears, or the itch from anything that brushes against my skin. My wardrobe, especially bras, are evaluated by "the itch." Today, I have been off my allergy medications for four day and I'm not going nuts with itchiness or pink blotches! I think the results are a combination of changing my diet, actually getting sleep, I've been taking CilZinco, a natural mineral, and lastly, dealing with emotionally stressful things in my life. I don't know why my dermographia seems to be going away. I never thought it could happen, but the above things are what changed. Any number of them could be the reason. I just wanted to share some ideas, maybe they could help you. Keep up the high spirits, enjoy the tic tak toe games on your legs (assuming I'm not the only one who plays the dermographic version), and I wish you less itch.